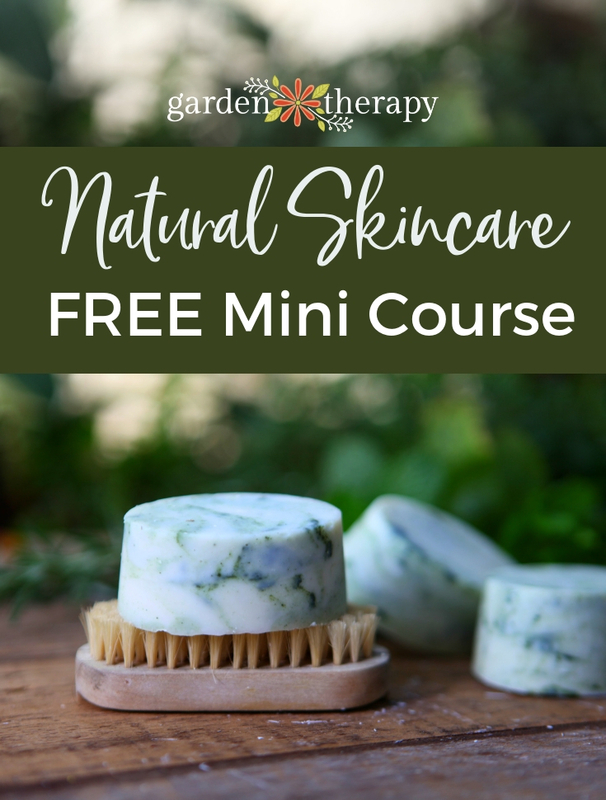 The bright pops of color and the sheer abundance of nasturtiums growing in my summer garden has me thinking of all kinds of ways to use up nasturtiums. Since they seem to get tossed in just about every salad in this house these days, I thought, why not turn them into a pretty and peppery dressing? 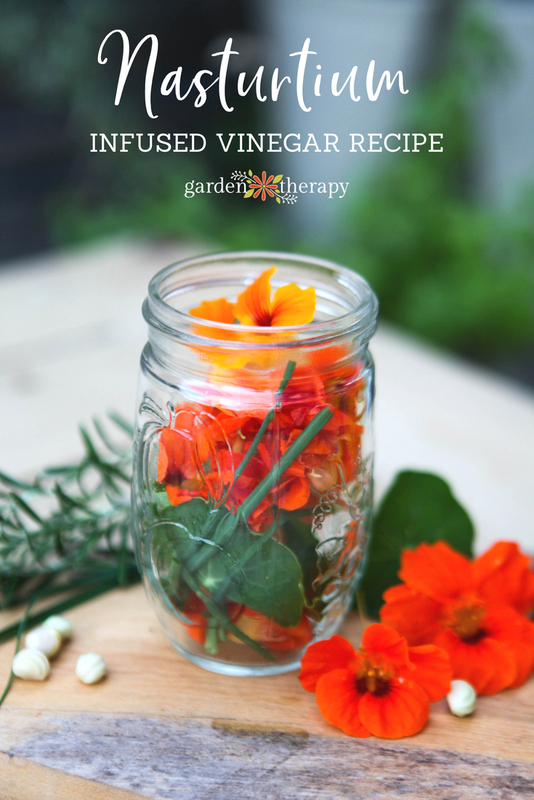 The first step is to infuse a good quality vinegar with jewel-hued nasturtium blossoms and even some of the leaves. Snip some fresh herbs and toss in some peppercorns, and you are on your way to the tastiest salad yet! 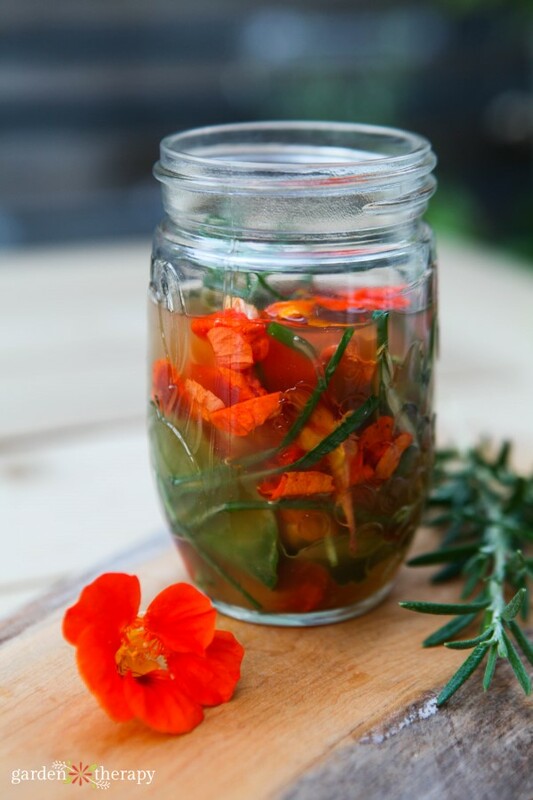 This fresh herb and nasturtium infused vinegar will change your summer salads forever. I write a lot about nasturtiums. I like them in salads, as flowerfetti, as living art, to attract ladybugs, and to deter pests. I have even been know to call them a season! Clearly, I’m a fan of these beauties. What’s not to love? They are gorgeous and tasty. You can eat the leaves and the flowers. 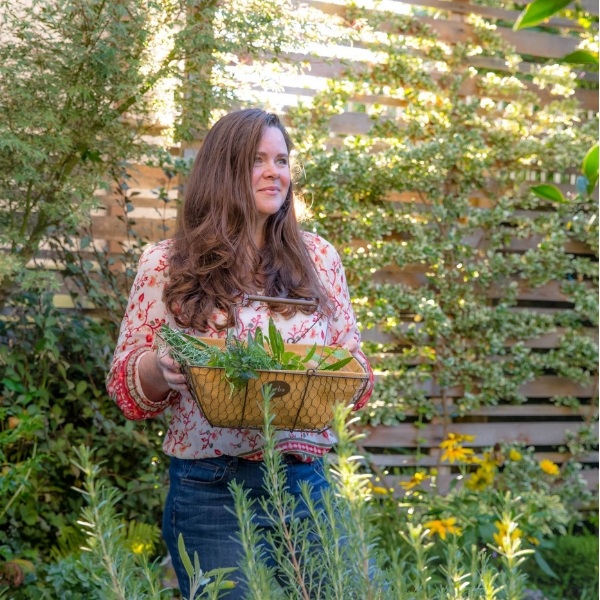 They have a lovely peppery flavor that’s perfect in garden-fresh recipes. I have even seen creative gardeners baking the leaves into chips (like kale chips). I’ve heard that some people have a hard time growing them, but in my Zone 7B urban garden, they seem to grow like crazy with no effort. Check them out growing off the side of my vegetable garden to the compost bin area. I grow Jewel Nasturtium Mix (Tropaeolum minus) from the Garden Therapy Edible Flowers Seed Collection. I love these flowers because they come in multiple colors that add a ton of beauty (and flavor!) to a summer salad, plus they bloom all summer long and into the fall. This compact, non-trailing nasturtium has semi-double to double, upward facing blooms in bright, fiery colors. It has a peppery taste and looks beautiful as a garnish. For best results, sow seeds directly into warm soil, thinning as needed. Cover seeds with soil (because darkness is needed for germination) and keep the top layer moist. If starting indoors, transplant seedlings outdoors in a full-sun location after the last possibility of frost has passed. 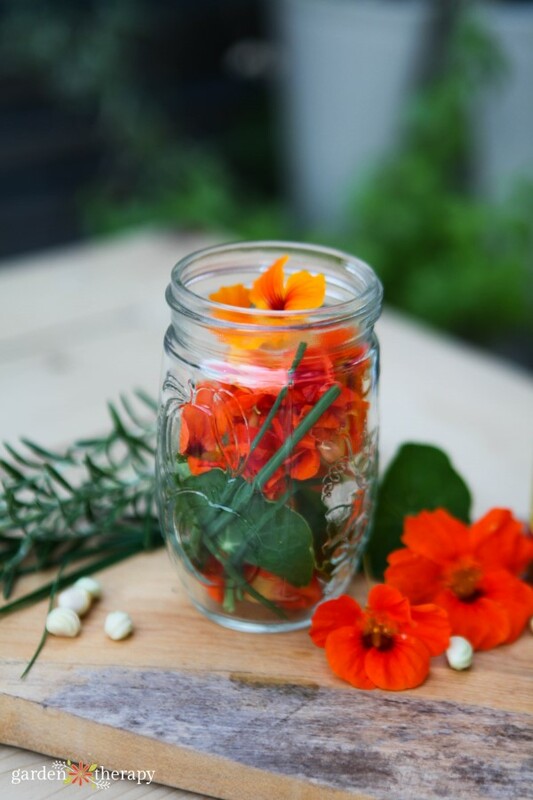 To harvest the flowers, read this post on Harvesting, Preparing, and Storing Edible Flowers. 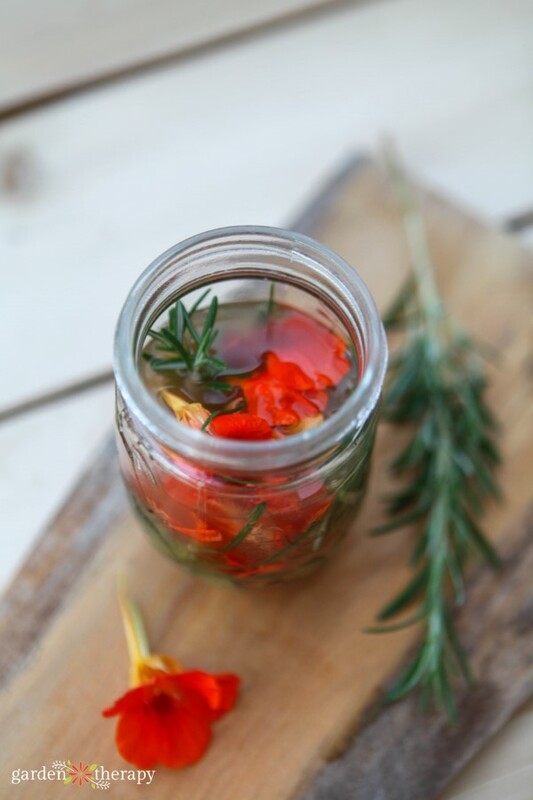 Then pack all the fresh ingredients into an 8 oz / 250ml jar. Top with apple cider vinegar. Add a lid and set it in the fridge for 2 weeks to infuse. After two weeks, strain the herbs and flowers. 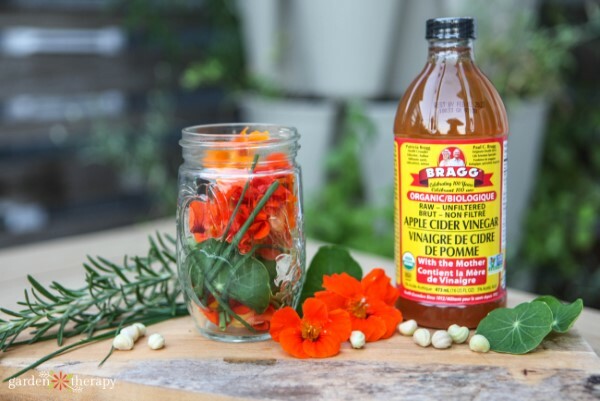 Use the herb and nasturtium infused vinegar to make a simple vinaigrette for salads.